Even though I primarily collect Indians cards, I also have oddball stuff in my collection. I'm going to be sharing these at various times, and who knows, maybe it will become a regular feature. These are 1996 ProStamps Team Set stamps. Basically, each team has five players depicted and a team logo stamp. The stamps are high quality stickers, really. The players featured for the Tribe are Kenny Lofton, David Bell, Eddie Murray, Manny Ramirez, and Charles Nagy. Each stamp has the player's name in gold foil, along with "USA 1996." 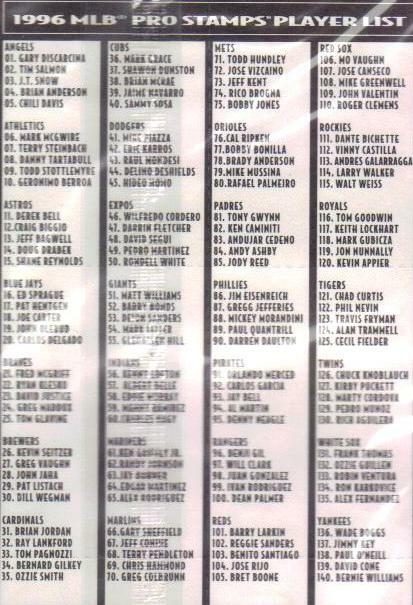 I decided to scan the back of the sealed package so you could look up your favorite player and/or team. Regular readers are thinking, "Wait a minute, David usually frees his collectibles from their sealed coffins." And, you'd be right. Normally, I do. In some cases, though, such as with these, I opt to leave them in their packaging. If you're looking for a rhyme or reason for which ones are released and which ones are not, well, keep the line moving. There is no rhyme or reason for that here. I'm pretty sure I scored these on eBay one day while trolling for Tribecards. Mine are out of the package,but I still didn't separate the stamps.Did you ever look close at the stamp that says "David Bell" ? Now look at the name on the checklist !! Ya know, I really hadn't thought about it before!! Wow, how funny!! Cards from the Crooks! and VOTE for me! MLBTV Indians Prime 9 - Do I agree? Welcome to the Clubhouse: One More Pack! Lofton heads for the hall (in Cleveland)! Where did the fun go? Phungo right here!